Wildlife officers rescued an injured bald eagle that was stuck on Metro tracks in Landover, Maryland, Wednesday evening. Dramatic video from Chopper4 showed them slowly approach the eagle as it sat just off one of the tracks near the Morgan Boulevard station. Several animal control officers covered the eagle with blankets before putting it inside a plastic blue bin. It's not yet clear how the eagle was injured or the extent of its injuries. The saga started just after 5 p.m. when Metro tweeted a photo of the eagle sitting on the tracks. 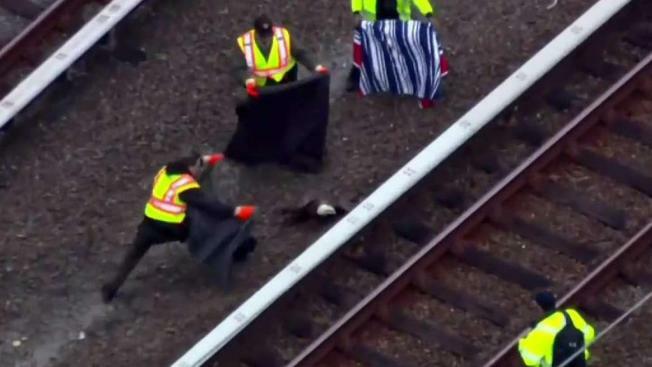 Metro says it took down power to the third rail as soon as someone spotted the bird. Silver Line trains were rerouted and Blue Line trains were single-tracking between the Addison Road and Morgan Boulevard stations during the rescue effort that lasted about two hours. Metro said about 7 p.m. that it was restoring all train traffic. Stay with News4 and NBCWashington.com for updates.